We have invested heavily in CNC equipment over the last few years focusing on 4 specific areas, Profiling and Plasma cutting, Vertical Boring, Milling and Turning. 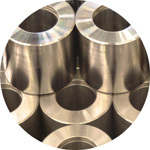 Our focus has been to develop our CNC business to enable us to successfully enter new markets, support our traditional operations by improving output and quality, to supply components to our in-house assembly and fabrication teams and to supplying a range of services to the larger end of the CNC market. 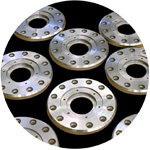 Consequently we are able to bore flanges up to 1800mm in diameter and turn shafts up to 1600mm in length. 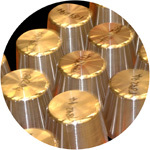 As well as supplying a number of customers with large quantity runs we have been able to develop this larger capacity to enable us to work closely with several customers working on smaller batch sizes of larger items. We operate a range of C.N.C. milling and machine centres including a Mazak V-550. This allows us to provide a comprehensive service to a large range of customers in the automotive, steel, aluminium and electronics industries. Together our milling and C.N.C. turning operations allows us to provide a comprehensive service on a variety of small items including small flanges, links, milled shafts etc. A variety of machined castings for the automotive markets. Turned, Milled and Drilled 55mm dia shafts 600mm long. Links for the air-conditioning and consumer electronics markets. We have a range of C.N.C. lathes capable of turning up to 1600mm between centres and turn diameters up to 400mm for a range of customers in a variety of industries. 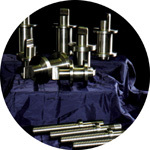 A range of mandrels and screwed shafts. Flanges, profiled, CNC Turned and Drilled. 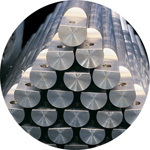 100 mm diameter by 1 mtr long shafts (in the cnc workshop) for the railway industry.